@erkan12: I don't even think hulk wins in a brawl. I mean, is there really anything that the Hulk can life that Superman can't? Besides, Hulk wouldn't be able to lay a finger on him. 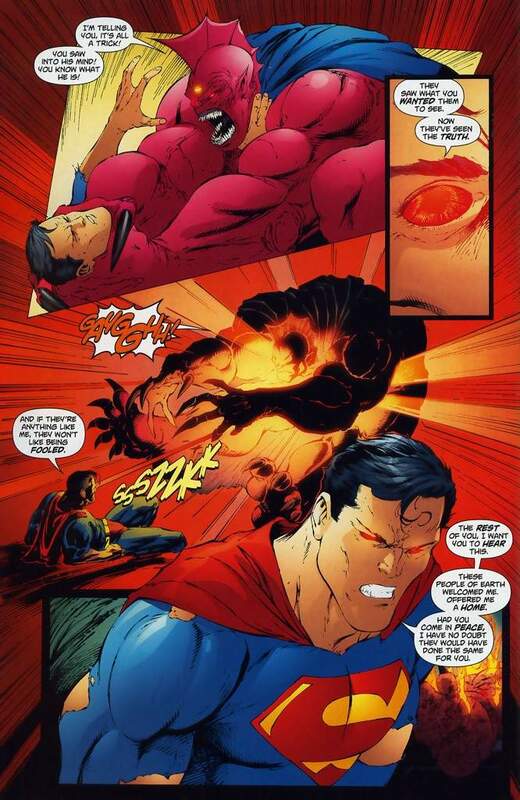 Superman puts his heat vision on laser-precision and lobotomizes Hulk causing him to revert back to Banner forever lol. Once he understands that the creature is getting stronger. Supes starts the battle out way, way stronger than Hulk. They would most likely both die of old age before Hulk can amp anywhere near Supes level. Superman would take this pretty easily even in pure H2H, let alone with all of his other tools. Hulk is already superman level or maybe stronger from the get go. Not sure what amp you are talking about. He isn't even close dude. Don't get me wrong eventually he would become a huge problem for Supes but the question is can Hulk survive Supes for that long? That wouldn't be a brawl if Supes fights like Flash or Quicksilver, hit and run tactics isn't brawling as far as I am concerned. Supes wins the all-out due to his speed and heat vision. In a brawl however, Hulk is not only getting stronger when he gets angry, his healing factor is getting faster too. Seriously, Hulk is the creature you should to choose in a brawl other than Juggernaut and H/P Doomsday. @erkan12: Arbitrary and unsupportable restrictions. In a brawl, Superman doesn't have to hit and run - he just hits at superspeed. with his natural, virtually unlimited might, tacking on speed to his punches and moving ability (like creating a hurricane of movement around Hulk; the way he did with that Imperiex drone that even Mongul had a problem with) would turn Hulk into green paste. Make that atoms - and no, he can't regenerate from that, because an atom of Hulk is the same as an atom of anything else. @twilightgod23: You're forgetting that Hulk's skin is incredibly tough and dense. Ares' spear, a direct Train crash, Hawkeye's arrows which was directly on his eyes, a chunk of grenades in his mouth, all of these were ineffective on Hulk's skin. And then he has a very very fast healing factor. Still wondering what makes Hulk physically superior. @darkhoudini: Maybe not superior, but physicality is Hulk's speciality. As you can see, beings like Cp.Marvel (she is 100+ class) is nothing to Hulk, in both durability and strength. Maybe not superior, but physicality is Hulk's speciality. And Superman's isn't? He just has added versatility. Also, physicality is the Thing's speciality as well, doesn't mean he wouldn't get utterly stomped by Superman (or Hulk for that matter). As if Supes hasn't shrugged off hits from 100+ characters before... Captain Marvel being unable to hurt Hulk isn't surprising, she's virtually an ant compared to either him or Clark. Superman's physicals are above Hulks, and while Hulk does have a healing factor Supermanits harder to start, is more durable is faster, and just as strong. As long as he piles on the damage to start he should win. And Hulk has been KOed but blunt force before. And Hulk has been KOed but blunt force before. And Supes has not ? What you have described here does not sound particularly 50/50. Superman is not as brutish as hulk, and is still very strategic in battle while also having super strength. It would not take superman long at all to find out which of his diverse range of powers hulk is weakest too, and he would also try and remove him from the battlefield which, due to superman's flying ability and super strength combination, would not take a particularly long time. Also as previously stated by some other members, superman has much greater speed and agility. According to some of your own points, it seems like Superman has a clear advantage. I’d estimate, superman’s best bet is to push hulk into the sun, and he probably get him there in 15 minutes flat. That’s a lot of time for Superman, but still not a huge challenge, especially compared to some of his other battles. Hulk still wins because he is physically superior, has a healing factor and becomes stronger the more he fights. Superman usually wins because of his superior speed which will overwhelm Hulk's durability and healing factor which is supported by Superman's tactical fighting and Moon-busting striking power. And he can't use his superior speed here. It took zeus level power to overwhelm the hulks healing factor. I say hulk wins because of durability strenght healing. *sorry for the spelling i cant see what i type due to some glitch. @krleavenger: I though he overwheled it sorry it has been 4-5 months since i have read that issue maybe even longer.Well has hulks healing factor been overwhelmed? @supergoku17: Your spelling is not that bad compared to other ones I have seen. Back to the argument, please no Death Battle logic. Zeus did overwhelm Hulk's healing factor. He negated it. Plus, Zeus is low Teambuster level. He is not Skyfather by any means, even less equal to Odin. And I'm coming to this conclusion based on feats. This feels like it comes down to when Superman says "This guy is too much and I have to cut loose". Presuming Luthor's mind control defies Hulk mythos and allows him control even when he's super raging, either Superman cuts loose at some point or Superman goes down. Especially if you make this a pure slugfest. When Nintendo decides my franchise is worth a new standalone game. Superman, and it isn't even remotely close. Lets stipulate that Hulk is stronger than Superman (not sure this is true, but for the sake of argument I'll concede this). Let's also assume that Hulk can eventually regenerate any damage done to him and is physically tougher than Superman (again, not sure this is true, but we will go with it). There are powers in Superman's kit that Hulk has no answer for. The first two are flight and the presence of a ranged attack (heat vision). It doesn't matter how hard Hulk can hit Superman if Supes never really has to be within 100 yards of him. It's like if there were another fight between Mike Tyson and Evander Holyfield, both at their peak. Tyson is stronger and can take a punch better. But Holyfield is in a helicopter. And he gets a rocket launcher. The other part of this fight that gets completely ignored is that Superman has incredible speed and the reflexes/reaction time that come along with it. Coupled with flight, he could open with heat vision, fly in, pound the stuffing out of Hulk, and fly away before Hulk's brain was able to process that someone was hitting him, much less do anything to react to it. Hulk has sometimes been described as "faster than he looks", but nowhere in his canon is there anything to suggest that he can react to someone who moves at a substantial fraction of the speed of light. And all of this completely ignores the obvious BRM type strategies that wind up with Hulk careening through space with nothing between him and the Oort Cloud and Superman sipping coffee with Lois roughly 2 minutes after their fight starts. So yes, if Superman sits there and trades punches with Hulk with something like the Marquess of Queensbury rules, there is a chance that Hulk could win. Lazy writers and the producers of Internet vs videos tend to portray a fight between them that way. But even a semi-creative use of the power than Superman has at his disposal ends this before the first part of "Hulk Smash!" can be voiced. For some reason, people pulling for Hulk think Superman is under some sort of obligation to kindly, conveniently stand stock still and-foolishly-trade punches with Banner. 76 unnecessary pages later, not a single reasonable, rational reason has been given as to why Superman would do this---mainly because there IS no such reason. Superman's frost breath, just in pellet form, pushed back Darkseid https://static.comicvine.com/uploads/original/7/78294/1495969-superman233gp.jpg. A quick flash freeze froze Bizarro https://static1.comicvine.com/uploads/original/11111/111113173/5402868-ac845-018.jpg-who is AT LEAST in Hulk's tier-in place. one shot heat vison KO'd Despero,a being of great power and density http://pm1.narvii.com/6077/c7c500a960480e806e75f4b5b4e85b8137125254_hq.jpg. ---so the notion that Superman's cold breath can't freeze Hulk, or at least hold him in place so Kal can tee off on him is false, as is the notion that his heat vision "can't" hurt Hulk (as can be seen above, it has done damage to persons, places, and things that are easily on par, if not superior, to Banner). the simultaneous energy blasts of Mongul and Mongal, and the blows of Mongul. ---so there really no way to honestly, factually claim that Hulk could-FOR SURE-resist what the super durable Cyborg Superman, the abstract form of Darkseid, and even an omniverse threatening planet couldn't. Yes,there are numerous ways for Supes to defeat Hulk---while Hulk has only brute strength to beat Kal---which, as shown above, Supes can fly away from Banner and use his range weapons, or vibrate to intangibility which ensures that jade jaws won't ever touch Supes, while he can attack Hulk at will. Superman wins. Equal strenght and durability, but much faster, plus he has other powers he can use against Hulk. @erkan12: Nice scans. I would say, however, that no - I am NOT forgetting how tough Hulk's skin is. I mean - we're talking Superman here; do you honestly think Hulk's toughness and density can stand up against the Man of Steel's offense?!? Superman can break adamantium, for crying out loud, if he applies a tremendous amount of force - but the thing is, this is very much within his capability. It's unreasonable to think that Imperiex's drones were made of something weaker than adamantium, and Supes used his heat vision and superspeed to shred that armor. Hulk cannot hope to stand against it - I doubt the formidable Green Giant is tougher than Darkseid (a certified invulnerable Dark God), and superman beat the brakes off him after dragging the fight to the just outside the sun's corona. Hulk will always be at a distinct and insurmountable disadvantage against Superman because, at best, their strength is a wash. I don't care how strong people say he can get - he ain't lifting 400+ quintillion tons. Rage is not an illimitable quantity. He's not combating Superman's heat vision. He will be frozen with the ice breath - if even for a short time; long enough to get tossed into low earth trajectory where he'll then calm down, turn back into Banner and die. @twilightgod23: Superman can break Adamantium because..? And Hulk has equal or better planetary lifting feats than Superman. @brucerogers: Still waiting to see Hulk's multiple planetary and beyond lifting feats... Can you help? Let's see, repelling Exitar, holding/pulling back the tectonic plates of Skaar (which IIRC is bigger than the Earth) together or taking the weight of what is equivalent to a star on his back from Proxima (though the effort did revert him back to Banner). @brucerogers: He never repelled Exitar, he just heald together a machine that created a planetary force field, Rogue with the power of a dozen different heroes giving their all, including Hulk, failed to actually repel Exitar and needed the Sentry's help, so it's highly-highly unlikely Hulk holding that machine equated to planetary force, and it logically shouldn't. Tectonic plates <<<< the entire planet, it's a good feat but not planetary at all. Also, Skaar is said to be larger than Earth because of a scan which states its diameter to be "12,150" but it doesn't say if that number refers to kilometers, miles or something else entirely; given that planets in fiction are generally depicted as Earth sized, plus the fact that no one traveling from or to Skaar mentioned any gravitational difference, plus the fact that the Earth's diameter in kilometers is suspiciously similar (12,756), it's almost a given that Skaar is around the same size as the Earth. That asteroid shouldn't even exist to begin with, it's way-way too big to not be a spherical planet, it either had hilariously low density (and thus mass) in order to remain in that asteroid-like shape or, as you said, it's a massive outlier for Joe Fixit. @darkhoudini: He never repelled Exitar, he just heald together a machine that created a planetary force field, Rogue with the power of a dozen different heroes giving their all, including Hulk, failed to actually repel Exitar and needed the Sentry's help, so it's highly-highly unlikely Hulk holding that machine equated to planetary force, and it logically shouldn't. So?. The whole point of the machine was that they needed someone strong enough to hold those electrodes together since that would directly depend on the strength of the force field that was covering Earth. Hulk' strength was sufficient enough to strengthen it to the point where it could take all of Exitar's weight and the machine only failed because of a flaw in the design. To put it in other words in case I am not clear, the whole machine and the force field was powered by Hulk's strength and could not be welded by just about any class 100. Rogue is nowhere near planetary even on her best days and Sentry (minus any amps) does not really have raw strength on a planetary scale either, so bringing them up is utterly irrelevant. He did hold part and pull all the tectonic plates of the planet together. It may not be a strictly planetary feat but it is very close. You know who else shouldn't have existed to begin with ?, Superheroes like Superman or Hulk since their powers are scientifically improbable. But then I remember that this is supposed to be a fictional comic book world where the writers are not obligated to follow scientific protocols to a T.
I already did call the feat an outlier if you recall and I only put it out there because you asked for his planetary feats. Hulk didn't power anything, he was just a cog in a machine, a strong one sure, but nothing more, he no more held planetary weight than the nuts and bolts that made up the individual parts of those electrodes did. Also, Iron Man specifically said "Doom's force field was never intended to encompass this kind of space, so the only way it's going to hold is if you can keep the electromagnetic anchors in place", he never mentioned anything about the amount of force Exitar would impact the field with, or his weight or mass, it looks like it had more to do with how large the force field was, not what it was holding back. Hulk was two degrees away from actually lifting Exitar, he held together a machine-that made a force field-that held off the Celestial. Rogue's power is to absorb powers... It was mentioned more than once that everyone gave everything they had and she still failed. It was Death Seed Sentry, the one who treated Thor like a child and was effortlessly ragdolling him, and he struggled immensely even with Rogue's help, Hulk was holding those electrodes relatively nonchalantly, nothing about this feat adds up. Here, a planet's crust is next to nothing compared to the rest. Fictional leeway and consistency, saying Hulk and Superman shouldn't exist does absolutely nothing, they do in their respective fictional worlds, it's what they do that concerns us. Planets, moons, stars and everything else that should is round in the Marvel Universe, gravity obviously exists, that asteroid isn't an anomaly is if it had very low density, and it would definitely fall more in line with Fixit's capabilities. Yes I asked for planetary and above feats, but not outliers. Yes I actually forgot to address that lol, Hulk was actually held down by the weight, it's not really lifting and it too is an outlier, heck, even more so than Fixit's feat, Hulk suddenly having large star level strength is an increase of well over two and a half million to his regular stength (assuming it's planetary), that's like Captain America waking up one day and juggling a couple Great Pyramids, or Quicksilver suddenly being faster than Flash, if that's not an outlier I don't know what is. @clownprinceofcrime1995: you know what I mean. Hulk can hold stars on his back whilst being hit with the force of a super nova yet he can hurt by spider man? You know it's ridiculous. There's no way to tell if the new 52 anti monitor is close to odin, he doesn't have any apearances yet. That's pure speculation on your part. Alternate versions? What? Sure it was planet hulk (who was considerably weakened and wasn't even as strong as savage hulk) but after that he was amped. Current hulk is stronger than planet hulk was. I don't know why you're binging alternate versions of superman into this. Throws around neutron stars like tennis balls? Good one. What? Your losing me here. I'm using feats that hulk has done and are still cannon to him. I'm just not pulling feats out of everywhere. I'm trying to tell you that they are indeed comparable in strength and durability (I'd say hulk is better in that department) but ultimately loses due to the speed gap. You consistently think that hulk is pathetic and doesn't have feats remotely comparable to superman. I, not going to bother with this anymore, no matter what you say someone always tries to lowball either side. Superman wins with ease. He's stronger, faster, more durable, and more versatile than The Hulk can ever hope to be. Even with speed neutralized, Superman's strength and durability will make this a quick fight. For saying Post-Crisis Supes doesn't have planetary feats under his belt, if I remember correctly, he pushed a Giant Spaceship, Earth, and the moon by himself at the same time. That's beyond planetary to me. Even if we take strength away, one or two moon busting+ strikes from Superman will allow Supes to punch a hole through The Hulk. Not to mention Superman's durability and other powers which will make this an even easier fight for Clark. This fight is a stomp. @iloveher19934: One or two moon busting punches isn't doing much to the Hulk. @iloveher19934: Do you honestly know anything about the Hulk? @abelhsu: will punches that can shatter small planets do? Or how about punches that can destroy planets? Hulk isn't standing up to too many of those from Superman. Of course I do, but there is nothing Hulk can do to Superman realistically. Superman will pick him apart and destroy him. @iloveher19934: Hulk has showings to suggest that he's not going to go down with a single planet busting attack.Superman wins here,but he has to land tons of punches like that on the Hulk.